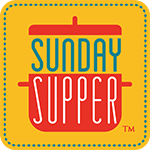 Today kicks off a week long event, hosted by Sue of Palatable Pastime. She's wrangled a group of blogers to share Mexicn recipes for the whole week. What fun! Happy #MexicanRecipes Let’s have a fiesta of Cinco de Mayo inspired recipes all week long! Check back each and every day for new recipes by following along with the hashtag #MexicanRecipes on social media. Are you a food blogger interested in posting within our blogging community? Find out more by joining us online: Holiday Fun with Our Blog Friends. Mince all the greens and place in a medium mixing bowl. Stir in the remaining ingredients and set aside. Mash all of the ingredients together in a mortar and pestle. Set aside. Heat olive oil in a soupot or Dutch oven over medium to high heat. Add onion, celery, and carrots and sauté until the onions are tender and beginning to turn translucent. Stir in the reserved Herbed Salsa Verde. Pour in the vegetable boullion and juice from the orange. Bring to a boil. Add shrimp and cook till just opaque. Ladle into individual bowls. Garnish, as desired, and serve hot. It's been a bear of a week. But, on Wednesday, I needed to take a deep breath, slow down, and celebrate my Love! He turned 42 this week. Thank goodness my Kitchen Elves are well-trained. They commandeered the breakfast menu, declaring that we were going to make birthday crêpes with three kinds of berries! 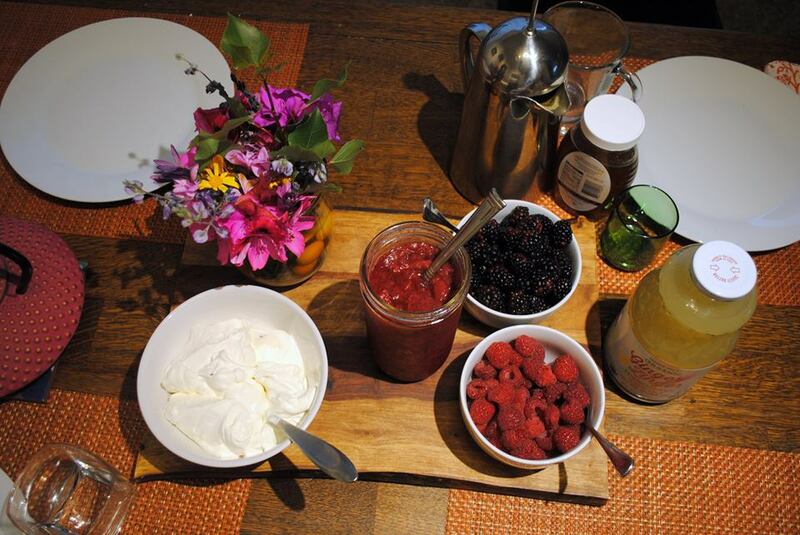 We found fresh organic raspberries and blackberries...and I had just made fresh strawberry-tarragon jam last weekend. Done! Whisk all of the ingredients together until lump-free. Let sit for at least 20 minutes. Heat a large flat-bottom pan and rub the bottom with butter. Pour the batter in the middle of the pan and quickly make a tilting motion to distribute the batter all over the pan. The goal: have as thin a batter layer as possible. Cook until the crêpes is a bit stiff and flip over, cooking for another minute The pancake should be lightly browned on both sides. 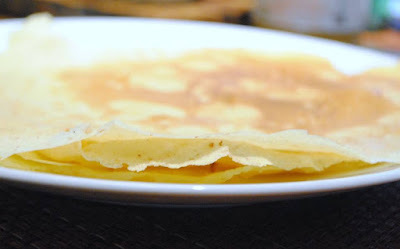 Repeat till all the batter is used; I made 10 crêpes with the quantities listed. Let everyone assemble their own crêpes. 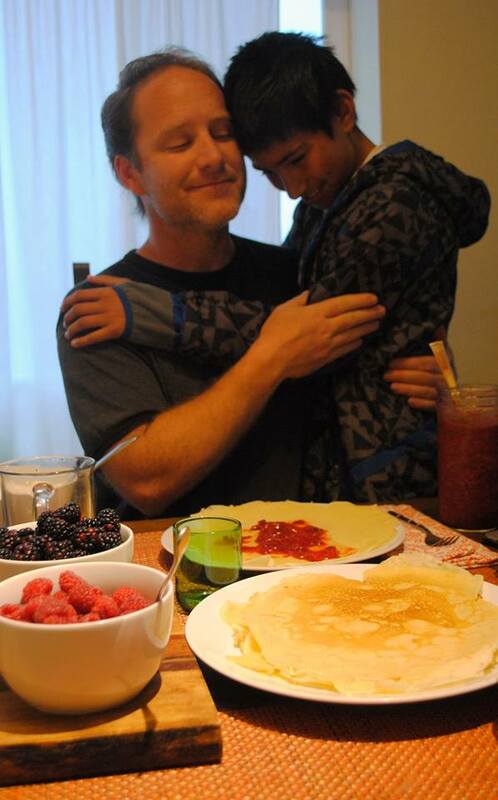 The birthday boy smeared his with strawberry jam, fresh berries, a huge dollop of whipped cream, and more berries on top! 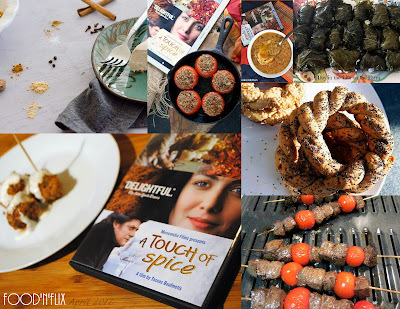 This month, it was my turn to host Food'N'Flix where we watch movies and head into the kitchen and cook or bake or make something based on a recipe they actually make in it or just something we were driven to make after watching it. And I've selected A Touch of Spice*. Truth be told: I hadn't actually seen it yet, but I'd read about it. And I'm always game for something about food, family, and history. We had a nice selection of dishes submitted, but I want to formally apologize to those bloggers who had a tough time finding the movie to watch. I didn't realize it would be a challenge to find a copy. Mea culpa. Some suggested the library and some bloggers shared their copies, shipping them to others who couldn't find it locally. That's one of the many reasons I love food bloggers: they are a generous community! To those who joined me, thank you. To those whose efforts were twarted, I'm sorry. I decided to divide my round-up into the three categories of food mentioned in the movie: appetizers, main dishes, and desserts. 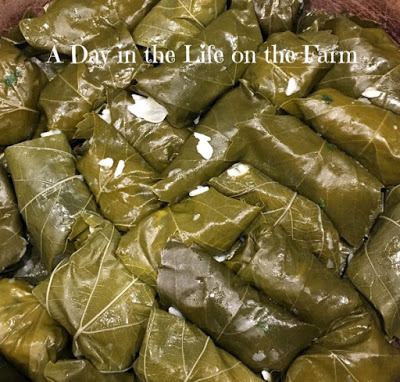 Wendy at A Day in the Life on the Farm posted her recipe for Dolmathes (Stuffed Grape Leaves) which she adapted from her son-in-law's family recipe. She shared: "[Pierre's] mom makes the best stuffed grape leaves ever. I requested her recipe and she was kind enough to share it. Like most cooks who are sharing a traditional food from their childhood, it was a loose translation. It had all the ingredients but no measurements. Those of you who are cooks, understand this dilemma well. Those dishes that we learned from our Moms and Grandmas that have some of this, some of that, a pinch of this, a dash of that....and time measurements....forget about it. How long to cook it? Until it is fork tender, of course." Wendy's stuffed grape leaves look delicious! Now, I'm not sure this would actually qualify as an appetizer, but I could see putting this out on a bread plate before a meal. Evelyne at CulturEatz shared Simit Rings: the Turkish Breakfast Bagel. She took good notes while she watched the movie, detailing "a very long list of food sightings in A Touch of Spice: milk and sugar, Coke, eggplant, artichokes, vine leaves, Ouzo, simit rings, garlic pepper garlands, herbs, mackerel, cumin, meatballs, dolmades, cinnamon, pepper, hot peppers, salt, dumplings, dünstest, germander, heart, lard, oregano, nutmeg, mussels, walnuts, olives, sausage, bread, onions, cloves, roses, thyme, okra, steamed clams, spanakopita, bonito, white bean salad, imam bayildi, hünkar, sauces, beef, souvlaki, stuffed tomatoes and peppers, lemon chicken, sweets, cake, pink peppercorns….. and many unrecognizable dishes at several dinner tables." So much inspiration, but I'm so grateful for what she shared. 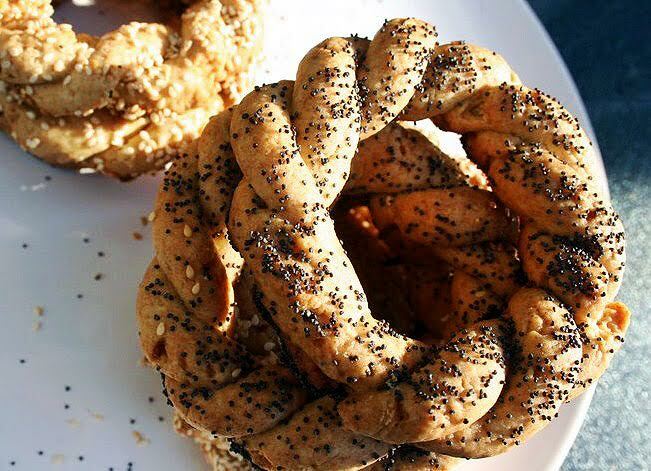 I can't wait to try her Simit Rings! She also included links to several of her previously posted Greek and Turkish recipes, including Dolmades with coriander, cumin & ginger; Shrimp Saganaki with ouzo, oregano & pepper flakes; Moussaka with cinnamon & nutmeg; and Turkish Apple Tea with cinnamon. I was completely overwhelmed by the amount of food that inspired me in this movie. 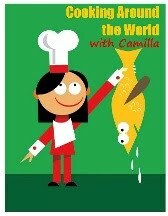 In the end, I cooked and wrote about 'Just Like a Woman' Meatballs, Culinary Adventures with Camilla. 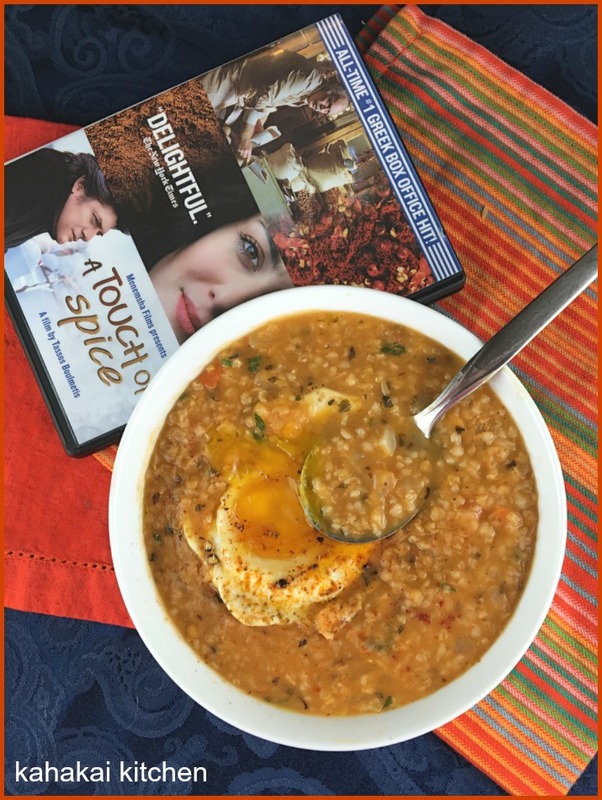 Deb at Kahakai Kitchen, who is our host for next month, created here own Turkish (Red Lentil) "Bride" Soup with Fried Egg drawing inspiration from the scene when the "family's brides are taught to cook (with disastrous results) from the 'secret' and stinky ingredient; 'kissa mamout.'" Deb admits that her soup "is not traditional with the additions of carrot, (mainly for color), the extra spices, swapping in Harissa paste for the tomato paste and cayenne, and putting an egg on top." Traditional, or not, this bowl of goodness would be welcome on my table anytime. Heather at All Roads Lead to the Kitchen opted to make Turkish Stuffed Tomatoes (Domates Dolmasi) inspired by the scene when Fanis finds his way into the kitchen where "the owner of the brothel is stuffing tomatoes and bell peppers, reminiscing about her own man in uniform. As she is working, Fanis asks her if she adds sugar, and she tells him that in the part of Turkey she comes from, they only add cinnamon." 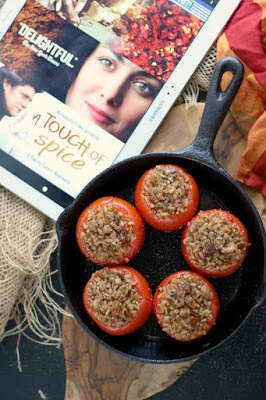 Heather made a version of domates dolmasi, or Turkish stuffed tomatoes, to go along with that scene. She notes, "I did not add sugar, but I did add cinnamon (sweet and bitter, like all women), and didn't forget the salt (life, it keeps us alive and makes life tastier) and pepper (the sun, it sees everything, and goes with all foods)...as a nod to Fanis and Papu's 'gastronomy and astronomy' lessons." Lynda from Reviews, Chews & How-Tos joined the fun for the first time this month, posting her recipe for Beef Kebabs. She writes: "A Touch of Spice tackles the impact of being a child of Greek and Turkish heritage in early 1960s Constantinople, during a period of political conflict where Greeks in Turkey were forcibly deported to Athens." She continues, "Food is everything to this story - it is memory, solace, an expression of pain and of will, and it is the glue that holds together one's personal and cultural identity when home is no longer home, and the very definition of home is redefined by nationalism and politics. Mostly, though, food is love." Moving into the third course of our recipe round-up, we have a Spicy Yogurt Pie by Chef Sarah Elizabeth. "'Desserts are the epilogue of the fairytale.' …and then of course I needed to make a dessert. I immediately thought something creamy would be great with a spicy mixture. Cheesecake! Since the weather is warming up here, I’ve also been craving lighter foods." 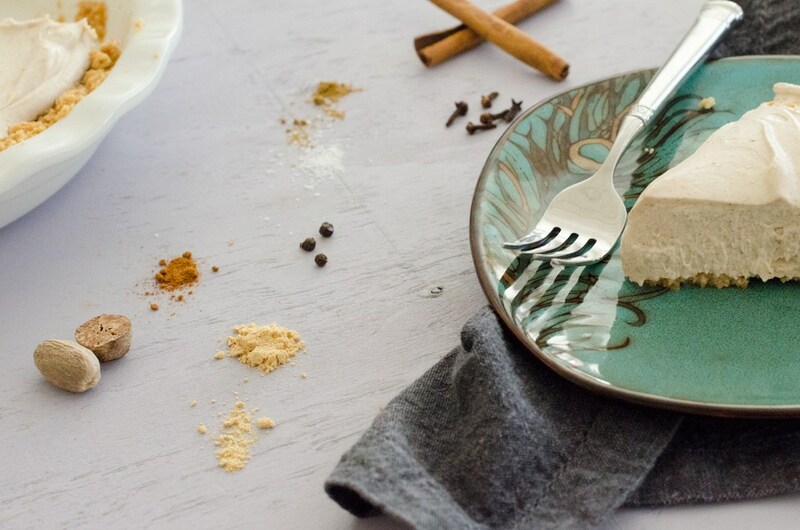 Her spicy yogurt pie is A Touch of Spice-inspired lighter version of a cheesecake. And the only thing that is baked: the crust. She writes, "No water baths, no long oven times, and also no frozen 'whipped topping' that feels like it coats your mouth with melted plastic." These Gluten-Free Chocolate Chip and Spice Cookies come to us from Terri at Our Good Life. She committed many of the lovely quotes to memory, including: "Cinnamon makes people want to say yes." "Our lives need salt occasionally." "Weddings without music are like relationships without arguments." And her favorite - like Sarah Elizabeth - "Desserts are the epilogue of the fairy tale." So, Terri focused on a simple dessert that wouldn't take the focus from the main meal, but had a good amount of spice. Plus, she's eating gluten free, so she kept that in mind for these cookies. I'm so happy and can't wait to make these for my gluten-free man! I'm so thrilled with out A Touch of Spice-inspired menu. These gals really outdid themselves! Next month, Deb from Kahakai Kitchen will be hosting us and inviting us to watch The Princess Bride! I know what I'm watching this weekend! "Anybody want a peanut?!?!" Here we are at the April Food'N'Flix event and I'm hosting! You can read my invitation: here. I invited the bloggers to watch A Touch of Spice. * And, truth be told, I had never watched the movie myself, but I knew that I would like it. I was correct. What a beautiful movie! Okay, so you already know that I was quite taken with this movie. The scenes in the past were filmed in muted colors, not quite sepia-toned, but softer than usual. I loved that instead of spraying their correspondence with perfume, they rubbed the postcards in spices. How fun...and fragrant. The movie is structured like a dinner, divided into three parts: appetizers, main course, and dessert. We see Fanis as young child in his grandfather's spice shop; as a Greek citizen being deported out of Turkey; as young adult, still in Greece; and as an astronomy professor who has returned to Turkey when his grandfather is gravely ill.
"Grandpa said the word 'gastronomer' conceals within it the word 'astronomer'. As such, my lessons in astronomy involved the use of spices," Fanis says. There was so much food inspiration in the movie. Tables full of food, kitchens full of women - and Fanis - teaching soon-to-be-brides how to cook, the grandfather's spice shop, and more. But I was inspired by an exchange in the spice shop and, then, Fanis' house about meatballs. When a customer comes into the shop requesting cumin and oregano for meatballs, the grandfather suggests cinnamon. She balks. The grandfather says, "Sometimes we have to use the wrong spice to get a point across; add something different. Cinnamon makes people look in each others eyes." Later, as he's teaching Fanis about spices, he tells him: Cinnamon is sweet and bitter "just like all women." That made me chuckle...and inspired this dish. I looked at traditional Greek meatball recipes (Keftedakia) and I considered Turkish meatballs (Kofte). But, in the end, I decided to create a recipe with elements from both. I simmered my meatballs in a spiced tomato sauce with a Greek-inspired yogurt sauce over the top. And, naturally, I used cinnamon in mine! Place all of the meatball ingredients together in a large mixing bowl. Blend well to combine. Form walnut-sized meatballs and set aside. In a large, flat-bottom pan, whisk all of the ingredients together. Over medium heat, bring the sauce to a simmer. Gently drop the meatballs into the sauce and simmer until cooked through, approximately 20 minutes. They will be firm to the touch. Season with more salt and pepper to taste, if needed. In a small mixing bowl, whisk together all the ingredients. Adjust seasoning to taste. You can serve the meatballs in the large skillet with toothpicks on the side and the yogurt sauce in a small bowl so diners can help themselves. Or you can plate three or four meatballs and drizzle them with the yogurt sauce. When I was trying to decide on a dessert for our Easter brunch, I was inspired by the bounty of beets I had just picked up from Serendipity Farms. I wanted to make a naturally bright pink dessert and settled on panna cotta. That is definitely my go-to, easy-to-make-ahead-of-time dessert. Some of my other versions include Espresso Panna Cotta, Cardamom Panna Cotta, Salted Juniper-Dark Chocolate Panna Cotta, and Matcha Panna Cotta. It's so easy to get creative. And the beets added that lovely pop of color. Funny story - I purchased PEEPs with the thought to use them to hold our place cards. Look right! The Enthusiastic Kitchen Elf was insistent: "Mom, PEEPs are not for decorating. They are for eating." Well, I'm not sure I agree with that. But he plunked them on top of my beet panna cotta and citrus mousse. And I can admit: they were cute. *To make the beet puree, cook your beets (roast, steam, or boil), peel, then blend or process until a smooth paste forms. Pour heavy cream into a medium sauce pan and heat until bubbles begin to form along the edges of the pan. Remove from the heat and whisk in the sugar and beet puree. Gently heat again until the sugar dissolves. Pour the milk into a large mixing bowl and sprinkle the gelatin over the surface. Let bloom for 5 minutes. Pour the gelatin mixture into the warm beet-cream mixture and stir until completely dissolved. Divide the mixture between your serving containers and let chill until set, but at least four hours. Bring lemon zest and juice, ¼ C butter, and ¼ C sugar to a simmer over medium heat in a medium saucepan, stirring to dissolve sugar. Remove from heat. Whisk egg yolks, egg, and remaining ¼ C sugar in a medium bowl until pale and thickened, approximately 2 to 3 minutes. Add 1 ladle full of the lemon mixture to the eggs to temper them so they don't curdle. Then, whisking constantly, slowly pour the remaining hot lemon mixture into egg mixture. Transfer everything back to the saucepan and cook over medium heat, whisking constantly, until curd is thickened. The whisk should leave a trail in the curd, approximately 4 to 5 minutes. Remove from heat and add remaining ¼ C butter, whisking until melted and curd is smooth. Transfer curd to a bowl and cover with plastic wrap, pressing the plastic directly onto surface to prevent a skin from forming. Chill until cold, at least 2 hours. Whisk cream in a small bowl till soft peaks form. Gently fold the curd into the whipped cream. Spoon mousse over panna cotta. Garnish with a PEEP, if using! When I make this again - not for Easter - I will garnish with some organic calendula blossoms. The bright pink and bright orange will look great together! Welcome to the April version of Improv Cooking Challenge. This group is now headed up by Nichole of Cookaholic Wife. 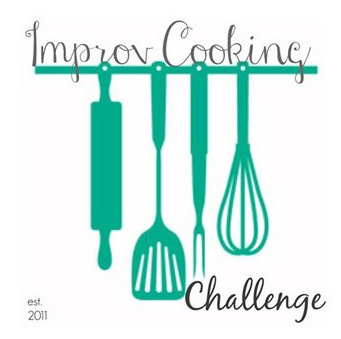 The idea behind Improv Cooking Challenge: we are assigned two ingredients and are challenged to create a recipe with those two things. This month's items: bananas and coconut. It just so happens that I made a dessert from Tuvalu for our Cooking Around the World Adventure that included those two ingredients! And I recently learned more than I probably needed to know about bananas when I read Banana: The Fate of the Fruit that Changed the World by Dan Koeppel. 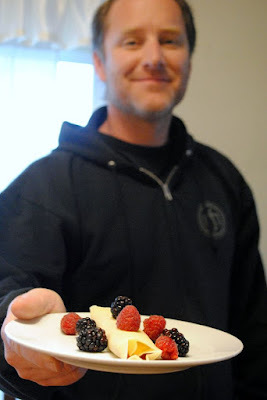 You can read my thoughts and see another banana recipe in this post. While this dessert is not a particularly photogenic one, it was delicious and everyone asked for seconds! I'll call that a success. Peel the bananas and place in a large pot. Pour in 4 C water and bring to a boil. Reduce the heat and simmer for 20 to 25 minutes. Mash the bananas with a wooden spoon. Add in 1 C water, coconut milk, and milk. Stir in the tapioca pearls, stirring while you add so that they do not clump together. Bring liquid to a simmer and cook over low to medium heat until the tapioca is cooked, approximately 30 minutes for the large pearls. Stir often so they don't clump together and get stuck on the bottom. The pearls are done when they turn translucent. Stir in the sugar and remove from the heat. Let stand for 30 minutes before serving. To serve, ladle into individual serving bowls. I am already having a crazy week; it's Spring fund drive time. Enough said. But I get to be around these kids and their enthusiasm and love of their school is infectious. Still I am determined to stick to my schedule of traveling by tabletop to at least one country per week with our Cooking Around the World Adventure. So, here we go to Tuvalu. 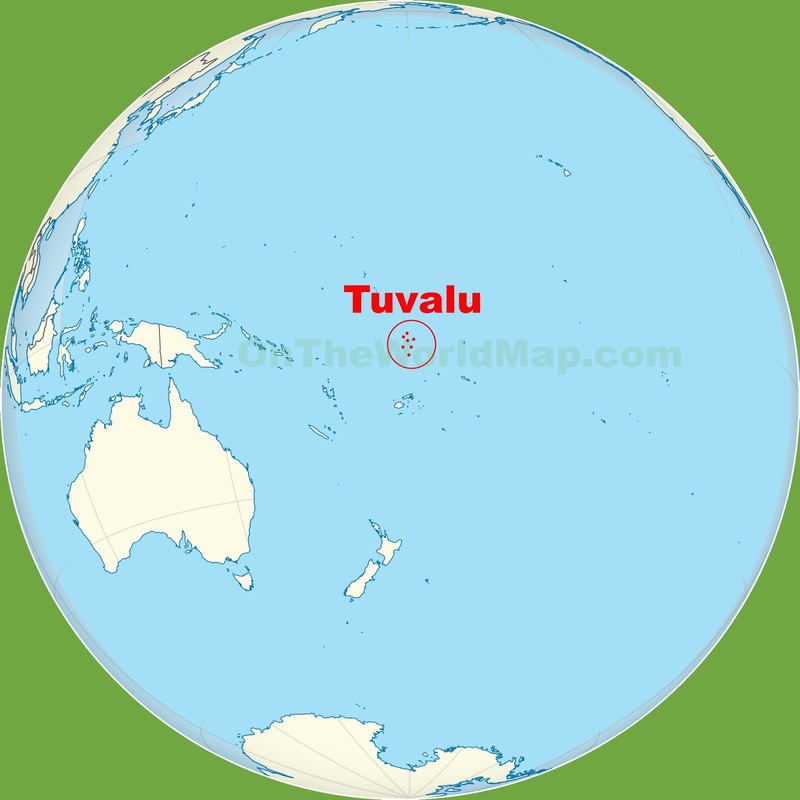 Tuvalu is a Polynesian island nation located in the Pacific Ocean, halfway between Australia and Hawaii. Its closest neighbors are Kiribati, Nauru, Samoa and Fiji. Comprised of three reef islands and six true atolls, Tuvalu has a total land are of less than 10 square miles! The small island of Nanumea played a significant role in the World War II when it served as the bomber base for the Allied Forces defending the Pacific basin. 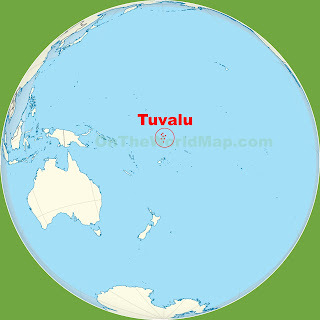 'Tuvalu', the name, refers to the country’s eight traditionally inhabited islands though there are nine islands that make up the country. I found a traditional recipe that involved steaming local fish in banana leaves; they use uku which is a blue-green snapper. I just happened to have black cod from our CSF delivery from Real Good Fish. This preparation ended up being a huge hit! And it's always a fun presentation to have to unwrap your dinner, right? It's like a culinary present. Place banana leaves on a flat work surface or cutting board. Place fish in the center of the leaf. Season the fish with salt. Fold the leaves to form a package and secure with kitchen twine. Repeat for the remaining 7 packages. Place the packages in a steamer or the top of a double-boiler set over lightly boiling water. Cover and steam for 10 to 12 minutes, or until cooked through. While the fish steams, prepare the sauce. 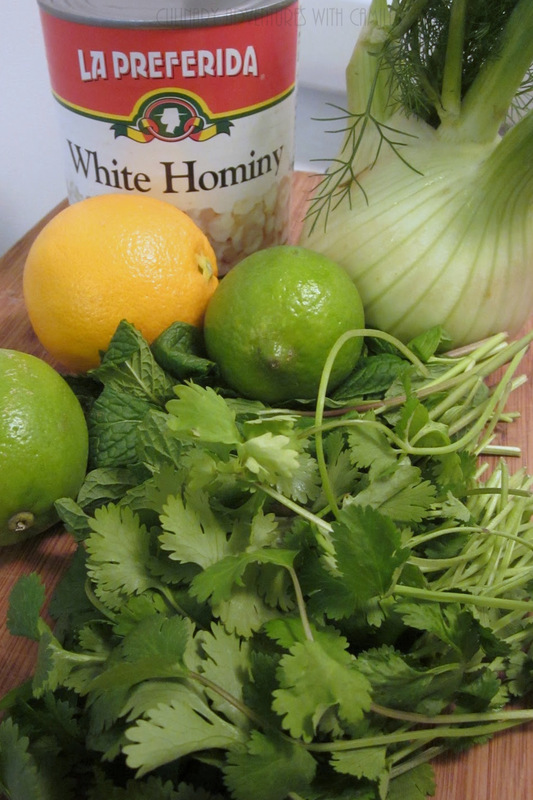 Combine the ginger, lemongrass, garlic, and chicken stock in a medium saucepan. Whisk until well-combined. Bring to a simmer over medium heat. Pour in the soy sauce and sesame oil. Stir in 1 T cilantro and 1 T parsley. Heat until warmed through. Set aside. To serve, place the packages on individual plates. Cut open at the table. Top the fish with the sauce. This dish is likely served with white rice. I served it with a mixture of brown rice and quinoa. This reminded me of the Ilocano dessert tambo-tambo. While I love the taste, I have never found it very visually appealing. Case in point: D walked over to the pot when it was cooking. "Moooooommmm? Are you making something with fish eyeballs?!" Yes, I lied. "Okay," he said, hesitantly, "this will be a real adventure - dessert with fish eyeballs." To be clear: this isn't made with fish eyeballs. It's made with large tapioca pearls. So, that's a wrap on our Tuvalu adventure. We are heading to Uganda next for our tabletop travel. Stay tuned. So, if you've been following the #4theLoveofGarlic event, you might have seen several of these recipes already. But I wanted to give you a place to see them all together. Besides several of us posted more garlic recipes than just on our assigned posting days. Garlicky bonuses are always good! I love these gals. They definitely brought their garlic-lovin' A-game to the table for this event. Many thanks for your creativity. Again, many thanks to the event sponsors: Dreamfarm and Melissa's Produce. We couldn't have done this without you! You can find Dreamfarm: on the web, on Facebook , on Twitter , and on Pinterest . *Disclosure: Bloggers received complimentary items from Dreamfarm for the purpose of review and complimentary ingredients from Melissa's Produce for the purpose of recipe development. Dreamfarm also provided prizes for the rafflecopter free of charge. Comments are 100% accurate and 100% our own. We have received no additional compensation for these posts. Last week was a ridiculously busy week. I mean, crazy. So, I only managed one dinner for our Cooking Around the World Adventure. After my second meeting with the IB consultant for R's high school, we traveled by tabletop to Turkmenistan. And this week isn't looking any better, so I hope to cook at least one country this week. Fingers crossed. Turkmenistan is one of six independent Turkic states in Central Asia and was once part of the Soviet Republic until declaring its independence in 1991. "It's one of the -stans," said R when D was looking for the country on a map. "You know Afghanistan, Kazakhstan, Kyrgyzstan, Pakistan, Tajikistan, Uzbekistan, and -"
When I first started researching recipes for Turkmenistan, I didn't find very many that were in English. Then I discovered the Twitter account for One Turkmen Kitchen and was saved! 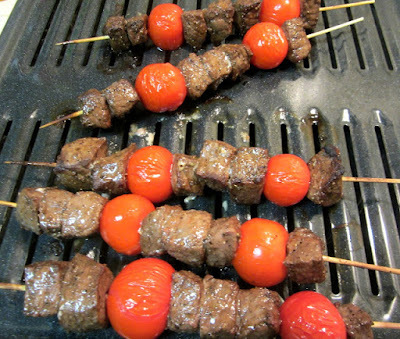 Photos and recipes in both Turkmen and English. Phew. So, I perused the twitter feed, clicked through to the recipes, and finally decided on three different recipes - one soup, one side dish, and one dessert. 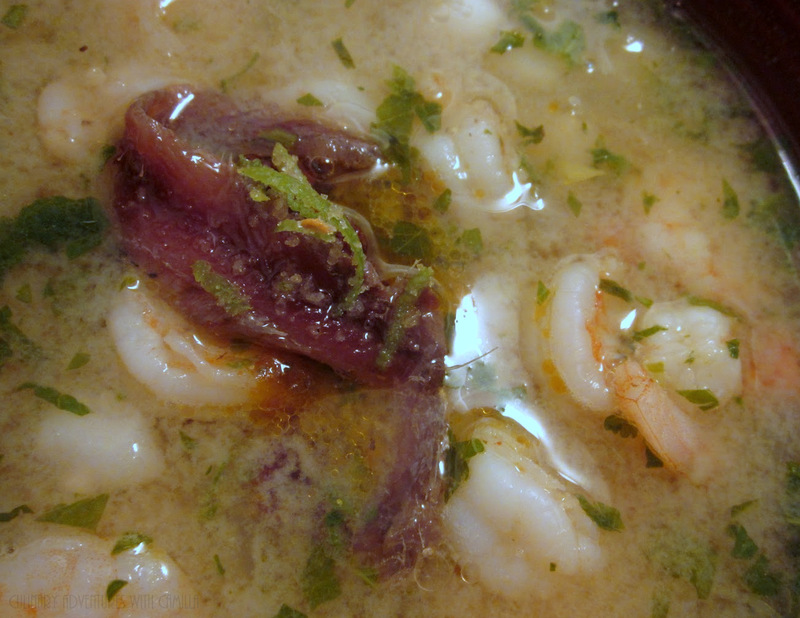 Unaş is a fresh noodle soup. Because I needed to make our noodles gluten-free, I used my own recipe for that part...and roped the Enthusiastic Kitchen Elf into helping me. I love making fresh pasta with him. And, truth be told, I really didn't follow the recipe; I just used the ingredient list for inspiration and forged ahead. Place all of the dry ingredients in the body of the food processor. Add the eggs. Pulse. Add in 1 T water at a time until it comes together in a ball. Turn the dough onto a floured cutting board and knead until smooth and elastic, approximately 5 minutes. Wrap the dough in plastic and let rest for 30 minutes at room temperature. To roll: Slice your dough ball into quarters. Cover the portions you aren't rolling. Turn the rested dough out onto a lightly dusted board and roll out as thinly as you can. I found that rolling it into a long rectangle make the most even strips. If you don't have a rolling pin, a wine bottle works well! Once the pasta dough is as thin as you can get it, starting at one (short) end of the rectangle, roll the dough into a cylinder. With a sharp knife, hand cut the roll into pieces whose width is the width you want for your pasta. I went about the width of linguine. Carefully unroll the strips and you're all set. I cooked the noodles separately and served them in the soup. If you wish, you can certainly cook the noodles in the soup. In a large soup pot or Dutch oven, heat olive oil and add Spring onions. Cook until the onions soften an become translucent. Add in the beans, red pepper flakes, and garlic. Pour in the stock and bring to a boil. Reduce heat, cover, and simmer for at least 30 minutes. Remove from heat and whisk in the yogurt until well combined. To serve, place cooked noodles in individual serving bowls. Ladle the broth and beans over the top. Serve immediately. Place cubed eggplant in a large mixing bowl. Sprinkle with salt, toss to coat, then cover with water. Soak for 20 minutes, then drain. Rinse the eggplant and drain again. Set aside. In a large, flat-bottom pan, heat the oil. Drop in the eggplant cubes and cook over medium heat, stirring constantly, until golden. Remove the eggplant cubes from the heat and allow to cool to room temperature. Combine the salad greens, bell pepper, spring onions, herbs, and eggplant in a salad bowl. Toss well. Mix the garlic, lemon juice, red pepper chile flakes together in a small bowl, then drizzle over the salad. Pour milk into a medium saucepan. As soon as the milk begins to rise, reduce the heat to a simmer. Add the pasta to the milk and stir. Cook according to the package instructions plus one more minute. Stir in the sugar and vanilla and remove from the heat. This can be served warm or cold. It thickens as it cools; we served ours lukewarm. And that's a wrap on our Turkmenistan adventure. We're off to the Polynesian island of Tuvalu next. Stay tuned!